The centerpiece of our forging operations is Lehigh Heavy Forge’s 10,000 ton open die hydraulic press – the largest in the Western Hemisphere. We also operate a 3,000 ton open die hydraulic press for smaller forgings and billets. 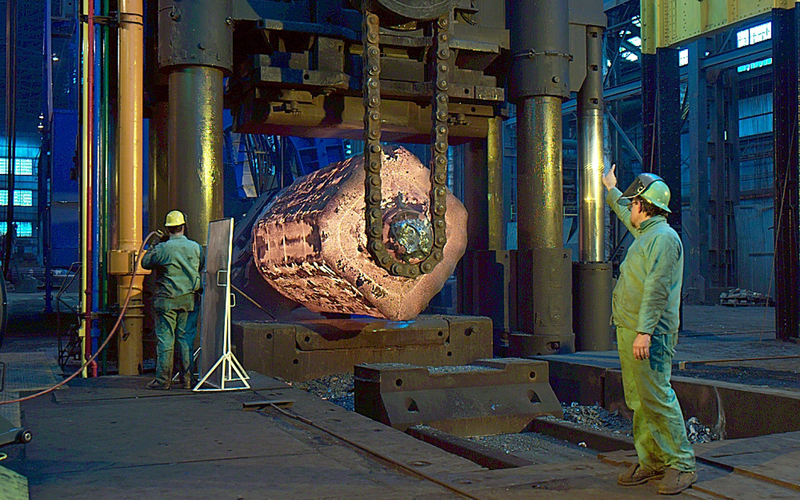 We are able to forge ingots weighing up to 285 tons and produce custom forgings with shipping weights up to 166 tons. On the 10,000 ton press the distance between columns is 182 inches and daylight is 220 inches. Supported by twin 200 ton overhead cranes, a computer-controlled 150 ton rail-bound manipulator, and drawing upon over 100 years of experience, Lehigh Heavy Forge has earned the elite status of Forgemaster. We are proud to operate one of the most capable and advanced forging operations in the industry. The centerpiece of our forging operations is Lehigh Heavy Forge’s 9,072 metric ton open die hydraulic press – the largest in the Western Hemisphere. We also operate a 2,722 metric ton open die hydraulic press for smaller forgings and billets. We are able to forge ingots weighing up to 260 metric tons and produce custom forgings with shipping weights up to 150 metric tons. On the 9,072 metric ton press the distance between columns is 4,572 mm and daylight is 5,588 mm. Supported by twin 181 metric ton overhead cranes, a computer-controlled 136 metric ton rail-bound manipulator, and drawing upon over 100 years of experience, Lehigh Heavy Forge has earned the elite status of Forgemaster. We are proud to operate one of the most capable and advanced forging operations in the industry.